A plaque which aimed to explain the past of a Bristol slave trader has been scrapped because of a row over the wording. 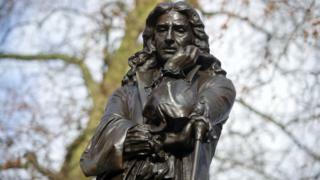 It was due to have featured on a statue of Edward Colston, who was involved in the enslavement of more than 80,000 Africans in the 17th Century. A group which runs charities bearing Colston's name said it wanted to "present another side to the debate". But city mayor Marvin Rees said the proposed wording was "unacceptable". The wording on the scrapped plaque referred to Colston as one of the city's "greatest benefactors", and later adds "a significant proportion of Colston's wealth came from investments in slave trading, sugar and other slave-produced goods". Colston, who made his fortune through slavery, was on the board of the Royal African Company. Between 1672 and 1689, ships from the company, are believed to have transported 84,000 men, women and children from Africa to the Americas. His statue, which stands on Colston Avenue in the city centre, currently makes no mention of his slave-trading past. However, in his home city, his memory has been honoured for centuries. On his death in 1721, he bequeathed his wealth to charities and his legacy can still be seen on Bristol's streets, memorials and buildings. Several of those buildings have since distanced themselves from any association with him, including the Colston Hall music venue which is to drop the name. The Society of Merchant Venturers runs many of the institutions and charities which bear Colston's name. Its spokesman, Frances Greenacre, said the city should not give up on "qualifying this misleading image that the statue presently gives, and the offence that it gives". Image caption Bristol's Mayor Marvin Rees said the proposed wording was "unacceptable"
Mr Rees said it was "extremely naive" of the Merchant Venturers to believe it should have the final say on the words for a new plaque "without reference to the communities of descendents of those Africans who were enslaved and treated as commodities by merchants like Colston". He said it was "an oversight... not to have even had a conversation with him as 'Europe's first Mayor of African heritage' and the mayor of a city whose wealth has been inseparable from slavery and plantations and who is himself the descendant of enslaved Africans".